I used to babysit my nephew Zac. At that time there was nothing more in life he wanted that to pretend he was Rudolph and I was Santa. I can't tell you how many Rudolph noses I painted on him with a red marker and how many times I galloped around the living room saying, "Okay Rudolph, shine up your nose!" while we flew around in our imaginary sleigh. I only babysat and I often felt so sorry for my sister who I know was sick, sick, sick of playing that day after day. Well, now I have my own four year old. 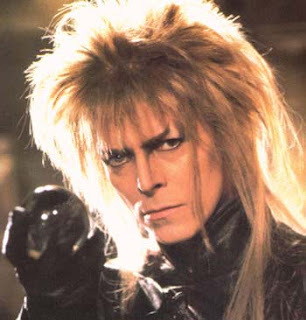 Maybe you could convince her that Evan is the goblin king??? I bet you are best for the part though...even if you don't look a bit like him. I like Julie's idea. It can be a challenge when in the middle of Walmart my daughter says, "No, mom I am the mom and you are the baby." She is not content until I start acting like the baby. She will say, "Ok, mom, start acting like the baby." Like I said, a bit of a challenge in Walmart or public period. Good luck to you! I guess it's just something that keeps us youthful!! I'm not familiar with the movie, but I'll tell you one thing seeing that picture gives me the heebie geebies! YIKES! Wake up and smell the... oh, nevermind.